This booklet follows two earlier ones of landscape prints by Ando Hiroshige, ‘Hiroshige’s views of Tokyo’ (1993) and ‘Hiroshige’s views of Mount Fuji’ (2001). In each of these books twenty prints were selected for reproduction and discussion, from the collection of the Department of Eastern Art, the Ashmolean Museum. This booklet follows that format. Kuniyoshi’s subject-matter could hardly be more different from that of Hiroshige, his more-or-less exact contemporary. Hiroshige usually depicted landscape, and the figures in those landscapes, if not actually insignificant, were usually small in scale and used to point up some feature of the subject. In Kuniyoshi’s prints the figures are the subject-matter; usually large in scale, frequently only one figure in each ōban size, upright print, there may be little or no interest in the background except, in exact contrast to the prints of Hiroshige, to set the scene for the warlike encounter depicted. In spite of the museum’s fine collection of prints by Kuniyoshi, the choice has been limited here, purposefully, to prints from either of two series. The earlier of these series is the Suikoden, the publication of which in 1827 pushed Kuniyoshi to the forefront of the print-makers of Edo. This series depicts semi-fictional Chinese heroes selected from the novel Shuihu zhuan, a version of which had been translated into Japanese by the novelist Bakin shortly before. Included also is one coloured drawing that conforms to the printed series. The second series, produced more than twenty years later, depicts figures supposedly from the Taiheki ‘Chronicles of the great peace’, but actually from more recent events. This transparent subterfuge was an attempt to avoid the strict censorship of the time. As before, we apologise that we are able to exhibit Japanese prints so seldom. In the lack of a dedicated exhibition space for prints and works on paper, not only do prints have to await their turn in our series of revolving exhibitions, but prints themselves are so subject to damage by light, that we have to exercise great restraint in our enthusiasm for their exhibition. The standard size of paper for most Japanese prints in ōban, 40 x 27 cm. Pearl S. Buck, ‘All men are brothers’, 2 vols., revised edition, Pennsylvania, 1937. 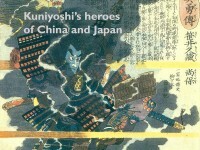 Inge Klompmakers, “Of brigands and bravery; Kuniyoshi’s heroes of the Suikoden”, Hotei, Leiden, 1998. B. W. Robinson, “Kuniyoshi; the warrior prints”, Phaidon, Oxford, 1982.